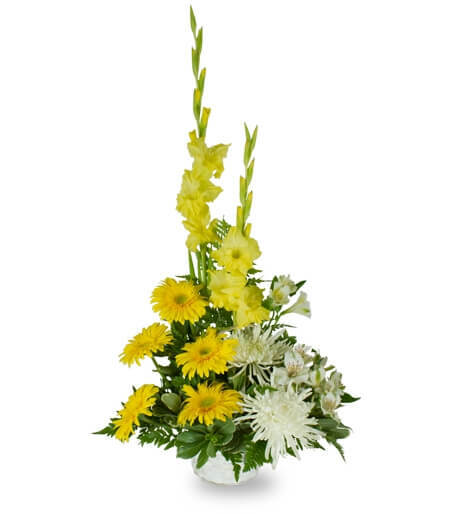 Vibrant yellow gladiolas and gerbera daisies gently rise above soft white spider mums and alstroemeria to convey peace and serenity. 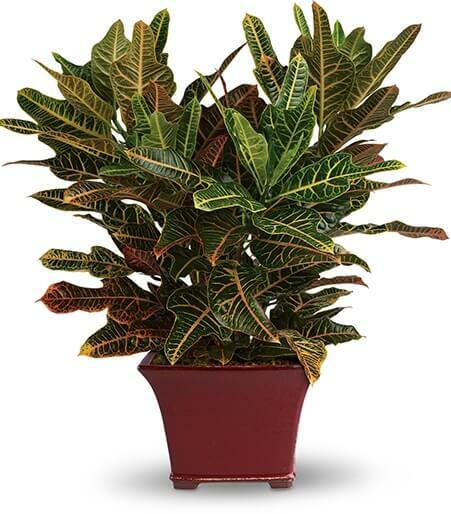 This one-sided, sectional arrangement is an elegant choice for a funeral service or the the family's home. The Winter Elegance Bouquet offers warm wishes and bright sentiments for a wonderful holiday season! 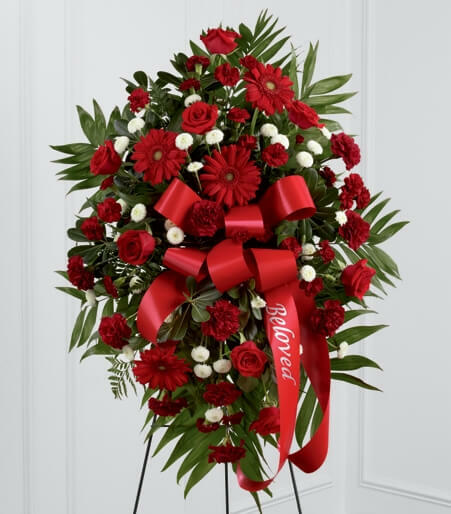 Rich red roses and peppermint carnations are delicately arranged amongst holiday greens to create a festive display. 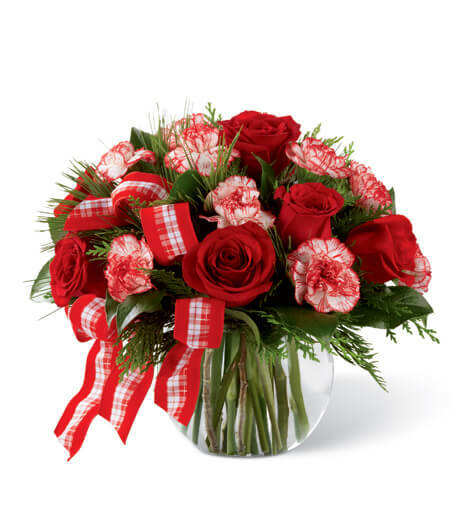 Arriving in a clear glass bubble bowl and accented with a red and white plaid ribbon, this arrangement is full of seasonal sophistication. Extravagant, beautiful and comforting, this generously scaled arrangement eloquently expresses your sympathy with an abundance of love and a profound manifestation of loss. 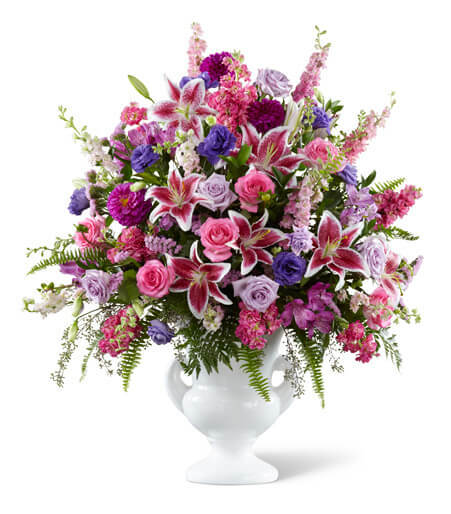 Handcrafted by a local artisan florist, it combines a colorful profusion of lavender and hot pink roses, pink statice, purple lisianthus and dahlias, Stargazer lilies and lavender alstroemeria ehanced with a rich and exptic variety of lush greenery in a classically-inspired white ceramic urn. 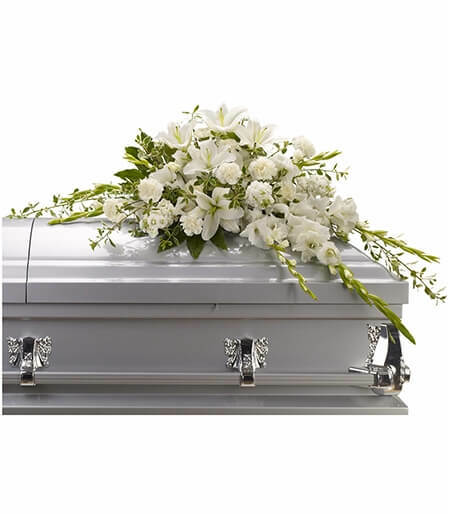 It’s an extraordinary choice that makes a big statement, sure to be noticed, greatly appreciated and and long-rembered, for a wake or funeral service. Style of container may vary. Product is not appropriate to send to a residence. 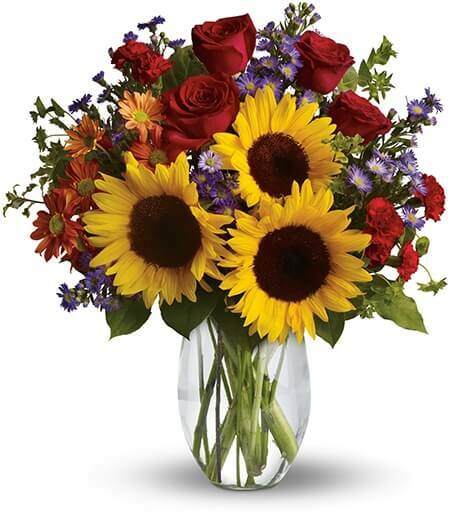 Flowers Across America makes it easy for you to send flowers to America from Northern Ireland. 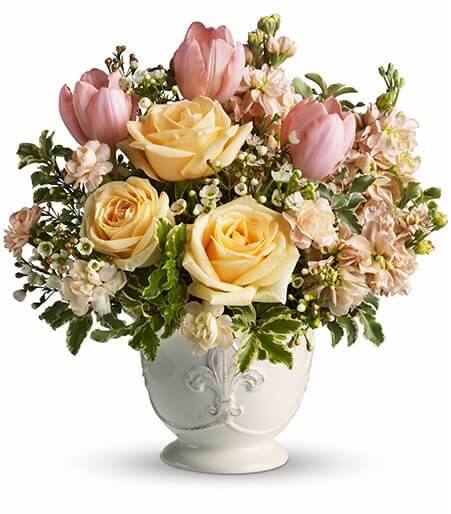 Northern Ireland florists will charge you a large wire fee to transfer the order to an American florist - place your order directly with Flowers Across America and save money and time - start shopping below!